Located in the south east of the North Island, Wairarapa is just an hour away from the vibrant capital city, Wellington. You can make an easy day trip from the capital to see working farms, country gardens, and wild coastline complete with seal colonies. Or stay overnight in one the region's many farm stays, bed and breakfasts, country cottages or exclusive lodges. Wairarapa is the perfect rural retreat in the very heart of New Zealand. 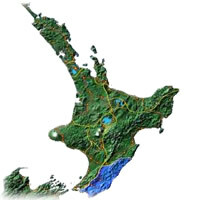 The Wairarapa is well known in New Zealand for its vineyards and its numerous craftshops. The region also hosts a growing number of activities including hot air ballooning, fishing, diving, hunting, mountain biking and surfing. A full day guided tour in Martinborough with guide includes visits to four well known vineyards in the Wairarapa region. The tour departs from Wellington with a scenic train tour to the region and includes wine and gourmet cuisine tasting, local wine making knowledge and antipasto lunch. The Tora Coastal Walk is a three day walking adventure in the stunning South Wairarapa. Situated 34 kms south of Martinborough, the walk traverses open farmland, native bush, windswept ridges, river valleys and the rugged Tora coastline. Accommodation each night is in comfortable fully equipped farm cottages. A fantastic 2-night/2-day fully catered walking experience over private farmland and isolated Wairarapa coastline. Starting at Whareama, situated near the stunning East Coast beach resorts of Castlepoint and Riversdale, come and join like-minded people on this challenging and breath-taking walk. You walk with only a day pack - the ideal weekend or midweek getaway. Let art help you heal, clear your mind and meet new friends. In this weekly class at the Featherston Community Centre we mostly work with acrylics. Contact: Julia O’Neale - 06 308 8977. The Featherston WoRN Cloth Collective is a drop-in workshop and community project, making fun items from recycled clothes/fabric, and learning new sewing skills. Call or text Sara on 0274 474 959 or just turn up! ?